Treevil is a walking tree enemy found in Mario & Luigi: Bowser's Inside Story. Their name is a portmanteau of "tree" and "evil". They can be encountered in Dimble Wood. It appears in two forms, one with sad glowing blue eyes and one with malicious red eyes, the latter holding an acorn on its branches; these Treevils are stronger. To attack, a Treevil throws twigs at the character. While playing as Bowser, Treevil will either lob the twig high into the air, forcing Bowser to use his shell defense, or throw it so it bounces along the ground, forcing Bowser to counter it with a punch. If a Treevil has an acorn, Bowser can inhale it using his Vacuum attack to restore 20 HP. When Mario and Luigi encounter a Treevil, it attacks in the same way, but the Bros. must counter the twigs with their hammers. The stats increasing with the berry is similar to Pidgits from the previous game. Bowser can use the Vacuum Block to inhale a Blitty from Treevils. In Mario & Luigi: Bowser's Inside Story + Bowser Jr.'s Journey, they no longer chase Mario and Luigi in the overworld. If they are fought though, one with a berry and one without a berry will always be encountered. They also appear in the Bowser Jr.'s Journey mode as enemies. They are ranged troopers, and are weak to fire attacks from Fire Bros. and Fire Stalking Piranha Plants. Bowser Jr.'s Journey bio: Trees that lived for hundreds of years before they became monstrous. As they are withering, they burn easily when attacked with fire. Magatsurī From 「禍」 maga, meaning "chaotic", and "tree". Spanish (NOA) Arbólico From árbol (tree) and diabólico (diabolic). Spanish (NOE) Malarrama From malo/a (bad or evil) and rama (branch). French (NOA) Arbolique From arbre (tree) and diabolique (diabolic). French (NOE) Épouvantarbre From épouvante (terror) and arbre (tree). German Alpbaum From Alptraum (nightmare) and Baum (tree). Italian Stregalbero From strega (witch) and albero (tree). 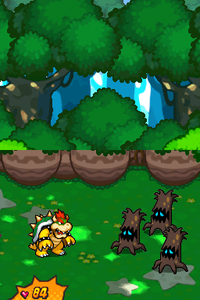 Treevils bear a resemblance to the trees with eyes seen in Forever Forest in Paper Mario. This page was last edited on April 6, 2019, at 17:26.